Dual-sided card printing option expands printable area without manually reloading cards. Cartridge-based card handling allows faster reloading or changing to different card stocks. High yield ribbon, film and overlaminate load fast and eliminate the waste of torn materials. Encoding options handling magnetic stripe, proximity, contact and contactless smart cards. USB and Ethernet connectivity plus internal print server for secure network printing. To ensure reliable card printing and minimize installation time, let us test your card stock free of charge. We will determine the printer dwell time and temperature settings needed to produce the best possible image for your particular printer and card design. We will also verify that your card composition is receptive to your printer's printing capabilities. The settings we give you should be considered the recommended starting point when setting up a printer to print cards. 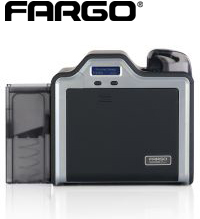 Optional single-sided or simultaneous dual-sided lamination for higher card security.